Grobetrotting With Jeff: "Night of the Refrigerators" or "THe ICE groberMAN COMETH!" "Night of the Refrigerators" or "THe ICE groberMAN COMETH!" Well it’s been a pretty uneventful week here in Yelapa, with just one ant attack and an event we’ve dubbed the “Night of the Refrigerata” – much like the movie “Night of the Iguana” with Richard Burton and Elizabeth Taylor that was filmed a few miles from here. It began with a loud “clunk” in the middle of the night. The next morning the fridge seemed a bit warmer, but the light went on when you opened the door, and there was still a humming sound coming from it. By the next day the butter had melted and the mils was sour…. Something was obviously wrong. 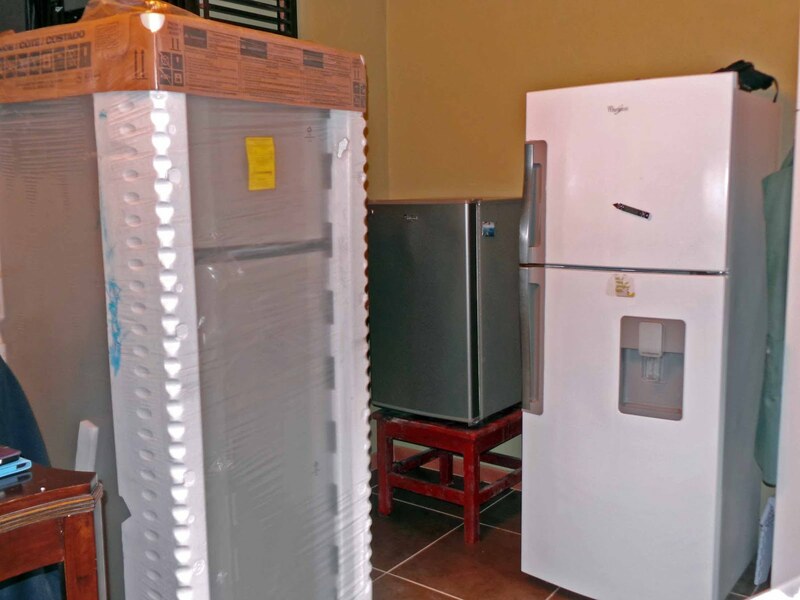 I figured we’d be without a fridge for several days until Luis, our absentee landlord, could get a repairman from Puerto Vallarta to come and look at it, so I was surprised when I was told there was an actual repairman living right here in Yelapa. Not only did he reside here, he showed up twenty minutes later – huffing and puffing up the hill to our casa. After a short rest he put his hands on the fridge like a faith healer and pronounced it broken. I told him I could have saved him a trip. He didn’t have the part he needed to fix it. The part, unlike him resided in Puerto Vallarta. Since it was a fiesta weekend it would be at least five days until he returned to fix it. Until then we’d have to haul bags of ice up from the village each day and put them in the fridge. Five days and many bags of ice later the guy showed up with the part. It definitely wasn’t the manufacturer’s specified part as there was much cutting, hammering and drilling to install it – but sure enough, an hour later the fridge was working. You can be sure if the manufacturer’s warranty hadn’t expired it was definitely violated. And miracle of miracles, it worked well…. For four days… when there was another loud “clunk.” Needless to say I wasn’t happy with the turn of events. I intimated to Angel, our landlord’s father, who lives in the casa below us that we were “definitely unhappy” and perhaps the last month’s rent (which I had wisely held back) might not be forthcoming. Angel told me the Yelapa repairman was out of town and wouldn’t be back for several days. He also intimated that it wasn’t the first or second time the fridge had gone on the fritz declaring it a piece of “basura” (garbage). He continued to say they were tired of paying good money after bad to have it continually fixed. I told him that it was their problem and I wanted a working fridge now… or else! Less than twenty minutes after my ultimatum, Angel returned leading an hombre carrying a large bar fridge on his back. He looked like a large tortoise slowly working his way up the path with Angel prodding him with a stick. Evidently this was Angel’s personal beer fridge from his man cave and he wasn’t thrilled about giving it up. He told me his son had ordered a new fridge from Home Depot in Puerto Vallarta and hopefully it would be delivered to Boka (the closest place to Yelapa the highway goes) and he would go in his little boat and pick it up and bring it to Yelapa. He would be back later in the day – depending on fishing. In the meantime we had his beer fridge. The next morning we were paid a surprise visit by the Yelapa refrigerator repairman who had returned to Yelapa prematurely. More drilling, hammering and sawing and the fridge was working again so I assumed the new fridge was no longer an option as we now had two operating fridges! So I was surprised when Angel reappeared with two hombres struggling up the hill with a brand new full size fridge. We now had THREE fridges in the kitchen. 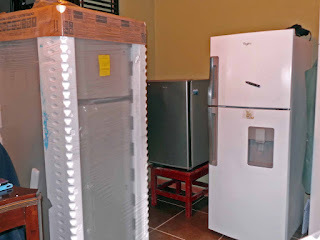 The new fridge would not be operational for several days as it had to “rest” after its bumpy ocean trip so the house is looking like an appliance showroom – new, used and scratched and dented! At this point I don’t care… As long as one of them works for two more weeks. We were paid another surprise visit by our friends, the army ants. They’re a bit more of a problem since they march in by the thousands. You can pretty well use half a can of raid trying to force them to retreat…. And then only for so long…. Most evening I patrol around the house after dark looking for signs of an impending invasion so I can launch a pre-emptive chemical attack. The problem is I gas myself as well most of the time. My daughter and granddaughters are coming on Monday. It should be interesting as they’re deathly afraid of “any” bugs…. Wait until they get a load of what’s waiting for them here! I' m confused. Is Friday night at Mimi's still an open mic or is it a gig that only allows other musicians' to play when the band says it' your turn? It was always an open mic and everyone was invited. Now it seems that musicians other than the 3/4 regulars have to wait their turn and hope to be 'allowed' to play maybe 3 songs max before being intimated off the stage. Some never even make it up to play and leave. When I heard the comment 'can I play one more song' last night I was pissed. Women singers especially are intimated. Has any woman sang more than 3 songs in a row? This is not the Yelapa way! Sierra Briano I have noticed this also and do not go to Mimis anymore because of it. Sad because there was an awesome woman named Heather there a few weeks ago. She has a fantastic voice and plays piano. She was booted off after 2 songs so the guys could continue their self centeredness. Laura Petch That is typically how jams work. You have to manage the talent. 10 people on stage creates cacophony. Aries Hough News flash: You're not the best band in Yelapa, just the loudest. Musicians should promote other musicians, not just go for the monopoly. Donna Wolper This isn't Portland but Yelapa where we allow for anyone who wants to offer their talent. It isn't judged. It s not about quality entertainment, but a venue for anyone to have the opportunity to share their talent. This is Yelapa! I’m not sure what side to come down on this one. Feel free to wade in. Speaking of alienating everyone…. As promised… Here is the article that was published in the Costa Rica national paper, which resulted in death threats….. I am pleased to have just visited your beautiful country to attend one of your excellent schools to improve my Spanish. I was most impressed with how progressive Costa Rica is. It’s political, medical, scientific and educational institutions rival anything we have in Canada. There is only one area in which San Jose lags behind the rest of world: Street names. “No, no, I want the number and the street!” I persisted. I have travelled all over the world – from the wilds of Papua New Guinea to Whitehorse near the arctic circle: From Nairobi Kenya to Hanoi in Vietnam – you look up even in the smallest village and you’ll see a street sign. Even the tiny Pacific Island of Yap where they still use stone money has street signs. “Hello Houston, this is Tranquility base. The Eagle has landed.” We are exactly forty meters north of Pops, just below the man in the moon’s left eyebrow.” Even if you look up in the sky every star has a given name and a specific address. It’s not the third star from the left end of the handle of the Big Dipper. I brought this up with a lot of my people here and they defended the practice: “It’s tradition,” they told me. Well so were cannibalism and slavery and we’ve managed to survive without those. So I think it’s time that San Jose joins the rest of the world and initiates a program to name or number it’s streets and avenues. It doesn’t have to be done all at once; it can be done over time. It can be phased in over a period of years. It can involve all the people. They can suggest names to a central committee to provide names for their particular street or avenue. Or it can be worked on a NSEW grid Streets running NS Avenues EW. I’ll even help out to get the ball rolling. How does Groberman Avenue sound?